Starting in the 1930s, the Communists made a conscious effort to free peasant women from their subjugation to fathers, husbands, and in-laws. In 1950, now in government, they passed the Marriage Law of 1950 giving women full legal equality to men inside the family. When it came into conflict with the realities of the lives of poor peasants, opposition developed. The surge in divorces created the most attention. Since the law gave women equal rights to the land as part of the requirement for their emancipation, upon divorce the woman kept her land allotment and equal share of any property gained during marriage. This undermined the new land reform movement in which the central purpose was to provide economic justice to the poor exploited male peasants. Men complained that they stood to lose both their wives and their property. 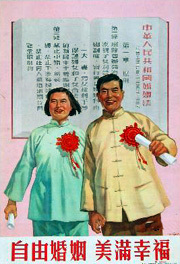 By 1958, however, the government needed women's labor as it tried to increase industrial production in a campaign called the Great Leap Forward. In rural areas farmers were mobilized into communes. In 1960, Li Kuei-ying, who was an official in the Liu Ling village People's Commune, told of her efforts to bring commune families in line with the expectations of the changing society. Source: Jan Myrdal, Report from a Chinese Village, Pantheon Books, 1965. Make a list of the traditional practices mentioned in the reading that today are considered human rights abuses. Why do you think these customs existed? What arguments did Li Kuei-ying use to convince the family to change its beliefs? What are your opinions about state involvement in a familys personal decisions. In this case was it effective? Would such an interference work in similar cases today? Why or why not. Research more recent family changes in China: the 1978 laws for strict limits on the number of children each family could have; the greater numbers of males to females in China; recent adjustments to Chinas Marriage Codes; recent divorce rates. 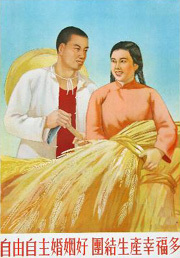 Poster of first female tractor driver Liang Jun, who was a child bride in the 1930s. 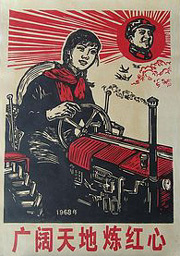 She was trained to drive heavy machinery and became a symbol for the socialist new woman. on free choice of partners. equal right to the land.